UT Chancellor James B. Milliken arrived Wednesday at the UTRGV Brownsville Campus for his inaugural visit. Milliken met with a group of UTRGV students from across all disciplines to discuss their experiences and success as university students. 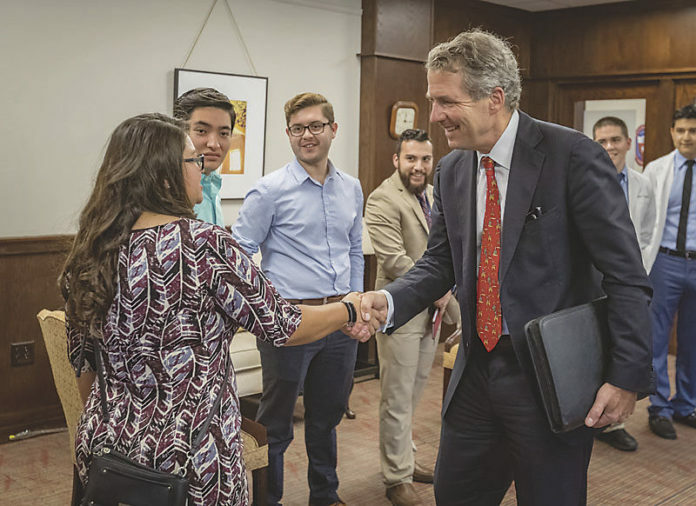 BROWNSVILLE — University of Texas Chancellor James Milliken began his first day in the Rio Grande Valley on the U.S.-Mexico border with a visit to the UTRGV Brownsville campus on Wednesday. This was part of the recently appointed chancellor’s tour of UT institutions; but unlike other visits, this university is unique and demanded more of his time. The chancellor officially took over the top leadership role of the system on Sept. 17. His goal, he said, is to have visited all 14 institutions by the end of November. His first day in the Valley consisted of meetings with 12 faculty members representing each of the colleges, and 10 students who joined him to go over some of their thoughts on the university. This was followed by a tour of the Brownsville campus and a private reception in Harlingen on Wednesday evening. Similar meetings will follow Thursday morning in Edinburg. Some of the faculty who attended said the closed-door conversation mostly focused on issues they would like to see addressed and options on how to address these. With the two main campuses in Brownsville and Edinburg being divided by more than 60 miles and teaching-space constraints at the Brownsville campus, professors at this location said they would like more options for their students to acquire a full degree at the Brownsville campus rather than having to commute. Some of the options discussed were increased access to technology, such as teleconferencing equipment in more classrooms, which is now used in some courses to connect the two campuses. This could in turn allow them to expand the course offerings, professors said. But it wasn’t all negative, said Rene Corbeil, professor and program coordinator with the college of education, as they realize a transition of this magnitude will undergo growing pains. The follow up with the students also included representatives from several colleges, including the school of medicine, college of science and business department.